President Xi Jinping has strongly condemned Friday’s terror attacks that shook Paris, and called on the international community to support China’s battle against Islamist extremists in the far western region of Xinjiang. “China always opposes all forms of terrorism and is willing to work withFrance and the international community to enhance co-operation in security, fight terrorism and ensure safety of people in all countries,” said Mr Xi, who was in Turkey for the G20 summit. “The terrorist attacks in Paris are yet another reminder that the impact and danger of terrorism are not to be underestimated and that terrorism has become the most serious and pressing security challenge for us,” he said in Antalya. He urged the West not to adopt “double standards” when it comes to Beijing’s fight against terrorism in Xinjiang, which is home to the largely Muslim Uighur people. China believes Uighur militants are trying to introduce an extreme form of Islam. 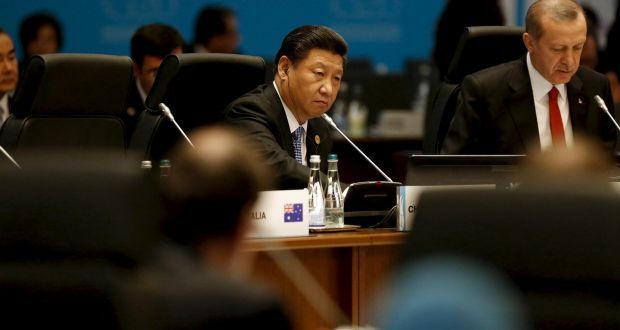 China feels the West does not condemn violence in Xinjiang strongly enough. In the past three years, hundreds have died in violence which Beijing blames on Islamist militants and separatists, prompting a major crackdown by authorities. China says its fight against the Eastern Turkistan Islamic Movement (ETIM), a UN-listed terror group, should be recognised as an important part of the international fight against terrorism. However, human rights groups believe Beijing exaggerates the threat to justify harsh controls in the region, which has seen tensions between Uighurs and Han Chinese settlers moving into the resource-rich province. Western nations have not co-operated with China on intelligence-sharing or provided other resources, saying China has provided little evidence to prove ETIM’s existence. Foreign minister Wang Yi said China supports France in safeguarding its national security and stability and in resolutely cracking down on terrorist activities. “China holds that joint forces should be formed to fight against terrorism, and that both the symptoms and root causes of the issue should be addressed. Double standards shouldn’t be allowed,” he said. The Xinhua news agency pointed out that ETIM had claimed responsibility for three recent attacks, including a fatal vehicle crash in 2013 in Beijing’s Tiananmen Square in which five died. It said ETIM launched a series of deadly attacks over recent years in different parts of China, including Beijing, Urumqi and Kunming, causing hundreds of casualties.